Estero, Florida in the rear-view mirror. This is Bonita Beach and our piece of heaven in Florida. One of the most mysterious effects of being in one place for a long time is how time folds in on itself and neatly puts itself away. 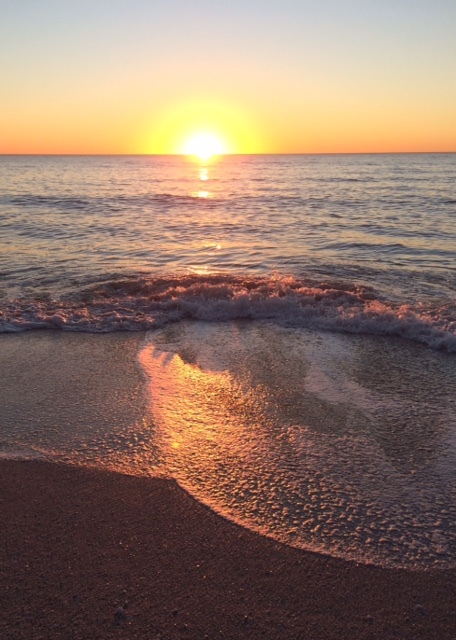 We’ve been in Estero, Florida for nearly five months and in that time, Christmas and New Year’s have come and gone, we witnessed what south-Florida calls the seasons – winter (temperatures in the high 40s); spring (temperatures in the mid-70s); and currently, summer (temperatures in the mid-80s). We pulled together a wedding reception for two of our fellow volunteers here at the park, complete with a cake and champagne toasts. We made a quick trip to the deep and frigid north for a wonderful family weekend, we celebrated a reunion dinner with Triangle X friends who winter here in Florida, met up with people we met on the road in Ann Arbor, and enjoyed a reunion with our first Airstream friends who met in the panhandle of Florida in 2015. We continue to delight in the company of our Koreshan State Park fellow volunteers following our official fourth anniversary living full time on the road. Peter with his children, Davis, Elizabeth and Justin at the party for Elizabeth. Thank you Ed, Izzy and Emily for putting together the party. The unexpected cards that life deals out continue when living on the road. From a devastating piece of health news about a family member far away, to the joyful news of my son’s engagement, to the breaking news of a nephew’s January 4, 2020 wedding in Chile, to the water-meets-MacBook Air debacle that happened the night before leaving Estero*, life continues. The unexpected and joyous party honoring a milestone birthday for Peter’s daughter took us back to New Hampshire for a cold, March weekend with Peter’s three children, and four of our amazing New Hampshire grandkids. Waking up to a couple of inches of new snow, blustery winds and the exposed, bare bones of New England trees, I was grateful to be merely a visitor this time. Earlier in the month of March, we had shared a much quieter birthday for Liz in the warmth and sunshine of Florida. It all occurred in this tiny slice of time. Tomorrow, Peter celebrates his birthday in the continued embrace of the loveliest of Florida days. Peter & his crew at the Cast Iron Cafe. Our jobs this year at Koreshan State Park were rewarding and lots of fun and very busy during the height of the season. Peter’s cooking program has been very successful and his crew this year was great. They were cooking on Sundays and sampling Koreshan recipes for upwards of 200 people a day, spreading the good vibes of historic recipes from Meyer lemon pie, to Koreshan risin’ bread, to bread pudding, and Portuguese cornbread, and some new dishes like pineapple cake, and coconut cake. In addition, this year, he has expanded a program called Lunch & Learn which includes a private group tour (which I get to lead and customize for each group), followed by a full lunch in the historic Cast Iron Cafe with his commentary on what folks are eating, all from original Koreshan recipes. It’s been really well received and he is hoping to expand it even more next season. Here I am in costume talking to a group in the Art Hall. The planning for year two of March’s Women’s History Month paid off with a record number of visitors this year. 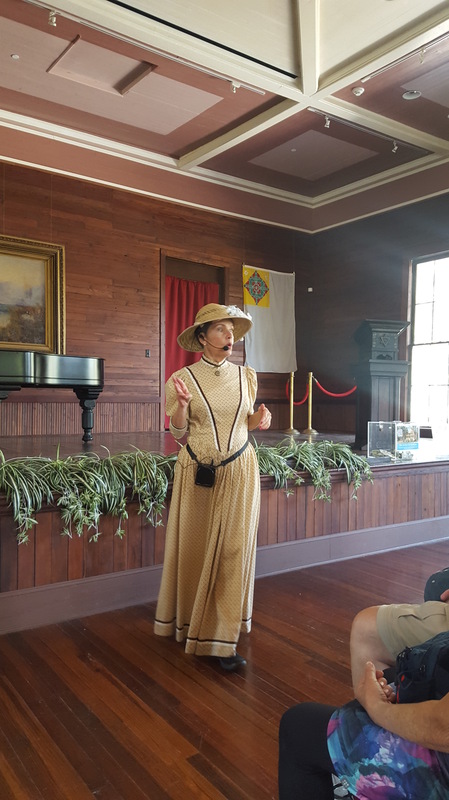 Our three special public tours throughout the month of March introduced guests to historical re-enactments of some of the women who lived here in the Settlement during its 98-year history. This year we had two great evening lectures in the historic Art Hall at the Settlement, including one about the music of the Koreshans, which included presentation of songs they performed using well-known music (like a piece of music from a Verdi opera) with lyrics written by one of the women in the settlement. The more that I learn about the lives of the Koreshans, the more passionate I become about telling their stories to our guests here at the Park. Our fellow volunteers share our love for the place and part of the delight of putting together a program like this, or Peter putting together his cooking program, is the way we can help people to better understand the complexities of their 19th century lives and the historical realities that led to the formation of this Settlement, and the hundreds of others just like it around the country. 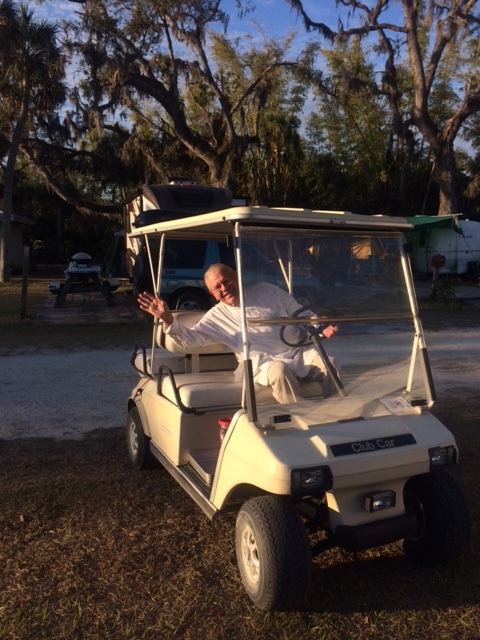 The golf-cart makes travel around the park a bit easier for Peter. We left the park April 1 on our generally northbound trip which is our continuing pilgrimage of life. We will take time off, re-grouping and visiting family in Florida and then North Carolina before heading up to Atlanta and the Jimmy Carter Presidential Library and hopefully, make it this time to Washington DC for more family visits and tourist time. Life on the road makes city visits more challenging since finding places to camp that are close enough to the interesting places is always present. When I was growing up on Long Island, merely 40 miles from downtown Manhattan, I took access to places like the Statue of Liberty, the Empire State Building, Rockefeller Plaza, and the Metropolitan Museum of Art for granted, thinking it would always be so easy to get to these places. But now, we are more intentional about our travel arrangements, realizing the days ahead of us are fewer than the ones behind, and we need to get on with it. 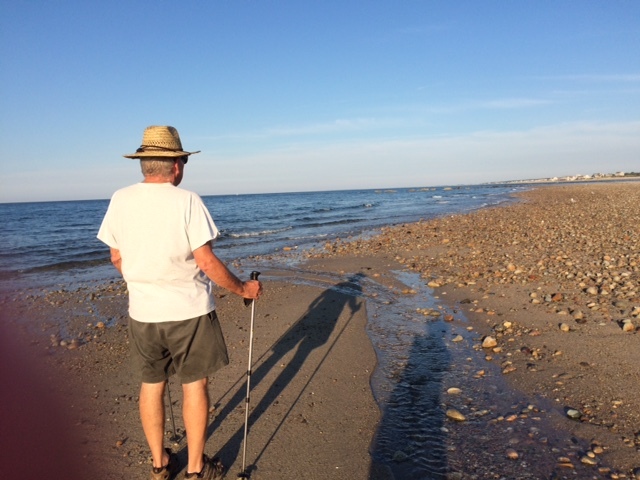 From last summer, I love this picture of Peter enjoying a walk just before sunset on the beach at Sandwich, Massachusetts. 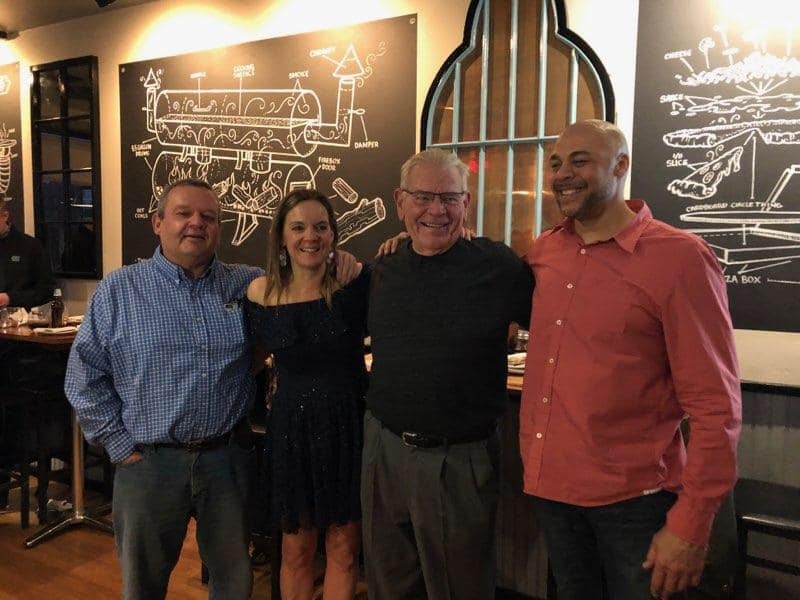 This summer, we will journey back to New Hampshire for a granddaughter’s high school graduation, more family time and then a completely new adventure. We plan to spend six weeks on Cape Cod as camp hosts at the beautiful Shawme-Crowell State Forest, a place we have camped a number of times. Close to the Cape Cod Canal bike trail, and the glorious beaches of the Cape, and favorite restaurants like the Ice Cream Sandwich and The Hole Donut, and more lobster rolls than I can imagine, the prospects are exhilarating. We have wanted to see what it would be like to be on the Cape during the summer for a long stretch of time and we’ll let you know how it all turns out. Thank you for coming along for the journey, and let’s stay in touch. 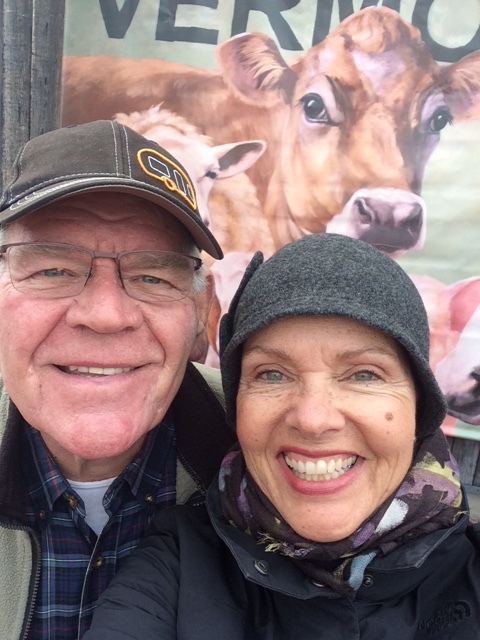 In closing this blog, here’s a souvenir photo of us in cold-weather gear in Vermont on our quick weekend trip north. Gotta love the cow poster in the background! * By the way, the MacBook could not be repaired and yes, this is the first blog on my shiny new gunmetal grey new MacBook Air. Peter and Liz continue their pilgrimage up the east coast, heading into Spring in their Airstream, and capturing memories and stories along the way. 48 hours in my Koreshan life. 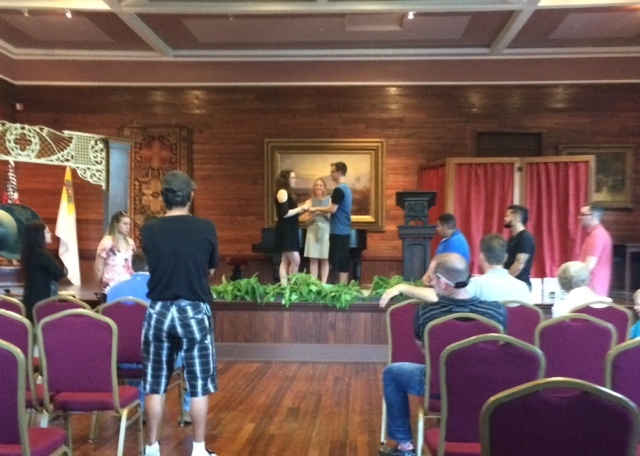 The wedding rehearsal underway at the Art Hall. Snapshots from the front porch. The lovely and gracious Art Hall, seen from the front, is my vantage point for the snapshots to come. The new kids on the block at Koreshan State Historic Park. We cross the Estero River as we walk from our Volunteer Village to work in the settlement. Getting settled into the Volunteer Village is like moving into a neighborhood. Our new neighborhood is tucked along the Estero River and has just one street made of hard packed sand and crushed shells. 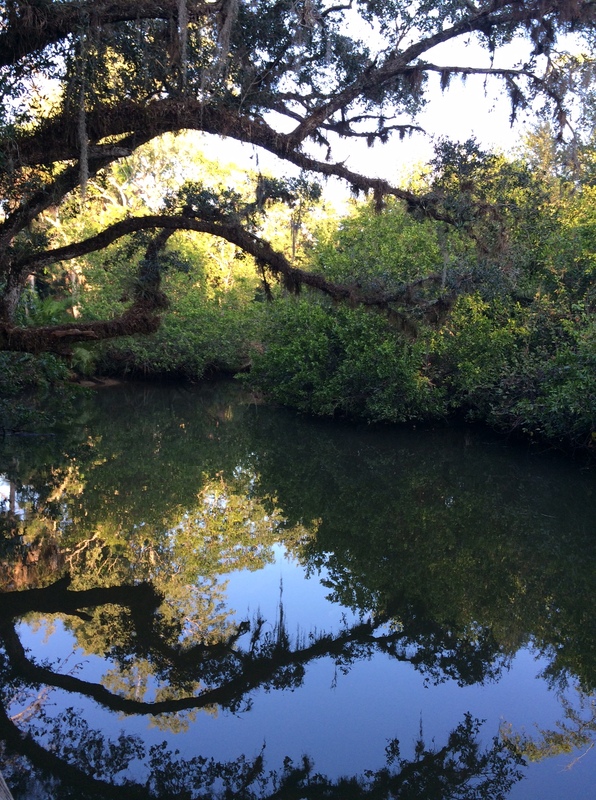 A total of about twenty of us, living in RVs and travel trailers and 5th-wheelers, make up this temporary community of travelers volunteering at Koreshan State Historic Park in Estero, Florida. All were here when we arrived, making us the “new kids on the block”. 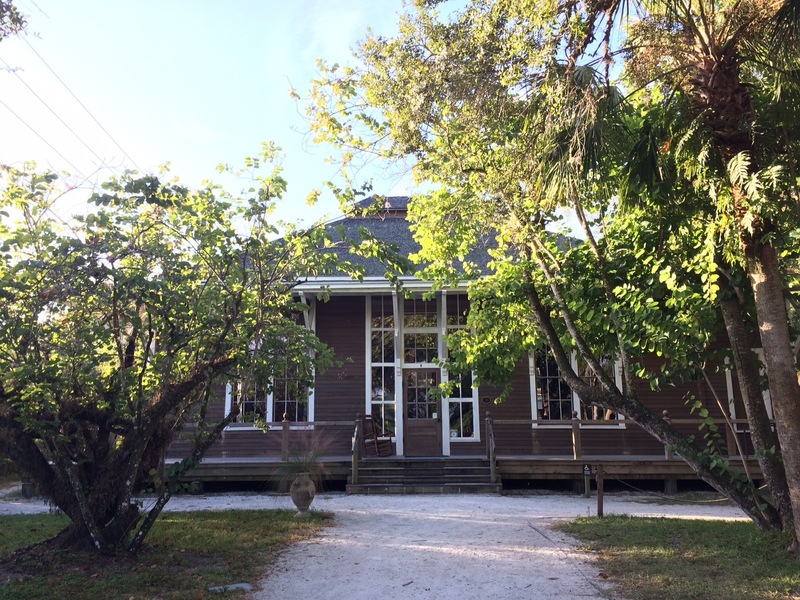 The Docents at Koreshan State Historic Park: an overview. 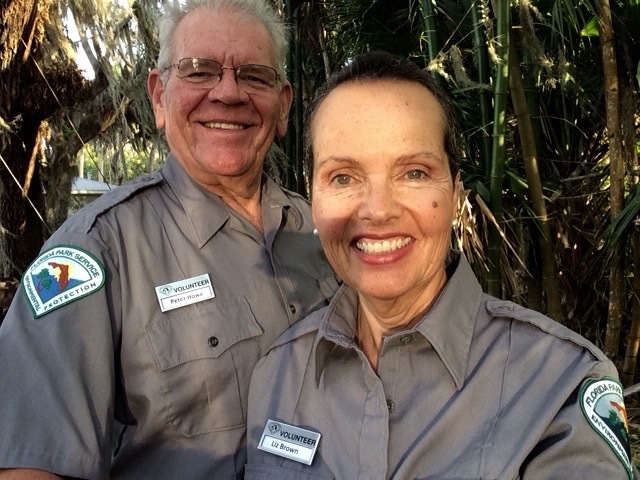 Here we are in our uniforms as we begin our docent gig at Koreshan State Historic Park in Estero, Florida.